A quarter of the world's oceans will be protected from fishing boats which drag heavy nets across the sea floor, South Pacific nations have agreed. The landmark deal will restrict bottom-trawling, which experts say destroys coral reefs and stirs up clouds of sediment that suffocate marine life. Observers and monitoring systems will ensure vessels remain five nautical miles from marine ecosystems at risk. It extends from the Equator to the Antarctic and from Australia to the western coast of South America. The high seas encompass all areas not included in the territorial sea or in the internal waters of a country. The agreement reached in the coastal town of Renaca in Chile will come into force on 30 September. It will close to bottom-trawling areas where vulnerable marine ecosystems are known or are likely to exist, unless a prior assessment is undertaken and highly precautionary protective measures are implemented. The delegation from New Zealand, whose fishermen are responsible for 90% of bottom-trawling in the South Pacific high seas, said the restrictions would "severely constrain" its fishing vessels. "Because of the cost implications of the necessary research and assessment and observer requirements, it may even have the effect of putting an end to bottom-trawling," it said. The Deep Sea Conservation Coalition, an alliance of leading environmental and conservation groups, welcomed the agreement. "This is a major step forward in the protection of biodiversity on the high seas," Matthew Gianni, a spokesman for the group, said. Mr Gianni said the deal was the first step taken towards implementing a UN resolution passed in December, which urged the adoption of unilateral "precautionary measures" to ensure bottom-trawlers do not cause significant damage. "This is the most significant meeting of fishing nations since the UN General Assembly resolution and it has done what the resolution required. "It can be done, it has been done, and it's time for all countries to do the same in all other ocean regions." In addition to the weighted nets and rollers which crush coral reefs, bottom-trawling targets slow-growing species of fish, such as orange roughy, which take decades to reach breeding age. 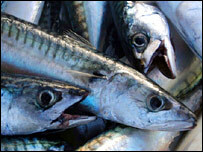 Such species are especially vulnerable to overfishing because the population replenishes itself very slowly. Last November, leading scientists warned there would be no sea fish left in 50 years if current practices continued.